TrackMania community is well known for his huge amount of interesting projects. No day is coming without a new project and THIS makes the force of the community. However, this huge number of projects gets a problem : some very interesting ones are not known and all these nice projects/tools/websites are lost in the web without a place to gathering them all. In the same time we had maniaActu. A very nice website who always wanted to gather community around news and creative projects but which was in pain since a year due to a lack of volunteers to take care of it and which was waiting for a new breathe deep inside. A big love was born ! All these great projects will find their store front here, on maniaActu ! But everybody knows that love stories are not always a piece of cake ! Sometimes it's nice, sometimes it hurts. And the road to achievement was full of pitfalls. But after 6 monthes of fight, we're able to release the BETA version of our baby ! First, what's new on this website and how it works? Second, who worked on it and was part of this beautiful adventure? At this point, be aware that it is a Beta version and also a test. Of course maniaActu new team did the work with pleasure but we're not dumb and we're not going to work like dead mans if no one is still interested by maniaActu. So the site will be updated step by step in the next few monthes depending on the feedback, the new tools we're going to discover etc. TrackMania news only, no more shootmania on maniaActu. The index page is now a portal. The news section didnt change except some lifting ! You can post your news as before via your account. Upcoming Event widget is provided by @maniacalendar. This widget show you the event to come in TrackMania. You can also found the details by clicking on "Event" on the top menu. Join a Server widget show you the 9 first servers on ManiaPlanet. 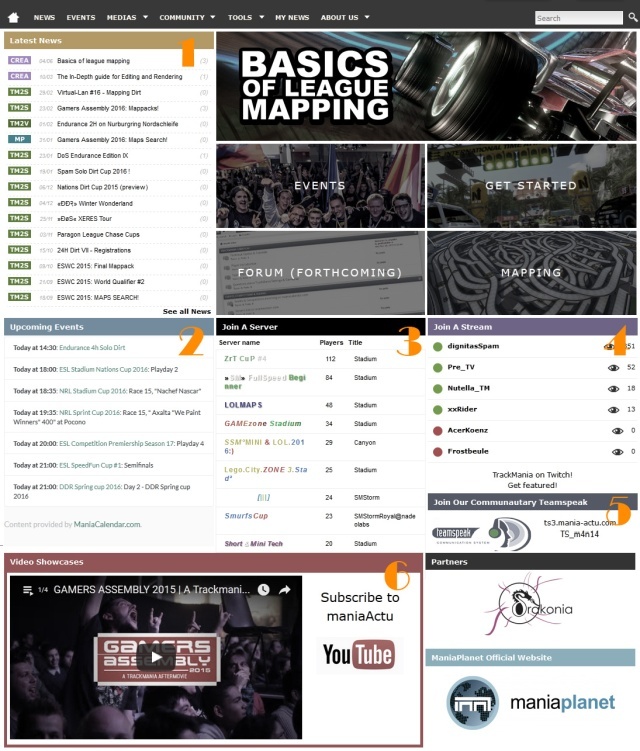 If you click on it you'll be linked to the home page of @maniaviewer where you can find all you need concerning data from ManiaPlanet servers and players. Join a Stream is showing you who is streaming TrackMania at this time. How it works? When nobody is streaming it will show the 6 most common streamers in TrackMania. As soon as someone is streaming he will appear on the top of the list. (we tried to list all the streamers we know in TrackMania but, to be sure that we didnt forget you, please send us a message to tell us that you're streaming TrackMania sometimes). Video Showcases will show you every last video we add to our mA playlist on youtube. Also you have 4 pictures linking to : Events, a Get Started Tutorial for begginers, MXchange and maybe a Forum coming in the next monthes. Some modifications are going to appear in the next few days, some stuff are going to be changed, but here is all you need to know to start with the new maniaActu ! Now me (mali) want to thank you very much all the lovely persons who took a bit of their time to contribute to this project. We're not pro coder (well for most of us), some of us are really busy with our own job, but i want to thank them for the help they brought ! and last but not least Sky & Jon, boss, coder and owner of this website. They needed an atomic war to go out from hibernation but they really helped to get this website stable ! Awesome work you did. Keep it up, its your baby, so it needs the care! Yep, i hope baby will grow up :) w8 & see! Hey Guys! Nice to see this new generation after this looooooooooooooong hibernation. Your goal sounds like the previous version (tm-actu) and i love that! It will be hard .... but it could be amazing. Anyway, one reader is already back! GL & HF! Quelle honte de voir le site uniquement en anglais, Boubisis tu as trahi ton pays, tes origines et tes racines. Tu es la honte de la nation.